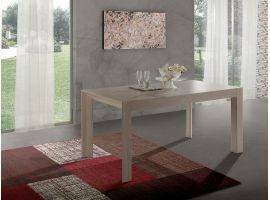 Dining tables are the protagonists of our dining rooms; they tell us the use of this fundamental space, always significant for our social life in our home: the central environment for each lifestyle, therefore, it must assure the strong idea, prepared to the last detail, the expressive force of the household atmosphere. In the dining room, the furniture and the objects speak for you. Anyways, the dining table remains the symbol of a dwelling, which represents and promotes the pleasures of fellowship. Everybody know the dining table, big or small, whatever it is, it will be always the king: the secret is to find the right size, proportions and weight to give harmony at your composition. It does not matter if round, rectangular or square-shaped, decorated or not; it could be discretely simple and essential or extremely imposing to show off. It must be said, the dining table is an indispensable piece of furniture, but so emotional too. For this reason, it should be in accord with the colours, the shapes, the lights of the living room area around. 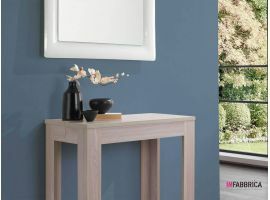 Emotional, but certainly not invasive: it is the warm core of your home, encircled by chairs, cupboards, armchairs, sofas, the pavement, the chandelier, also the paintings on the wall… everything underline its beauty and quality. The layouts adapt themselves in several environment, projected, as well as the finishes, according to the demands of the individual customers. Characterized always by the handmade attention to the manufacture and to details, which declare and testify the success of our furniture, InFabbrica can combine the artisanal care with the high quality of materials, as well as for dining tables. Tradition and passion for the research, the innovation and the selection of new materials, our enterprise always launches new products technologically advanced and safe. Our experience is our fortune 360-degree. 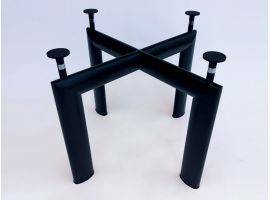 All our tables are design products, appreciated by those who like the classic flavour and who prefers an ultramodern choice. Clean profile and at the same time imposing lines in an atmosphere of measured elegance and originality. Refined materials, extreme care for details and great comfort are the essence for a great staying in the living room. 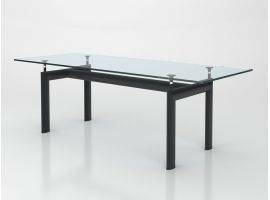 Are you looking for a table in glass or in crystal? In natural wood or lacquered? In steel, aluminium or other materials in melamine? The project of the table that we will choice together, will take account of the modern technology and the artisanal care, extraordinary treasure of our brand. 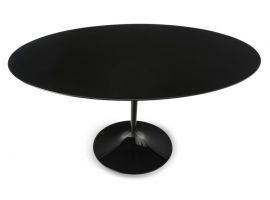 Rectangular or square-shaped, round, oval, elliptic… extendible or not (did you know that even round tables can be extended?) or in some case folding too. 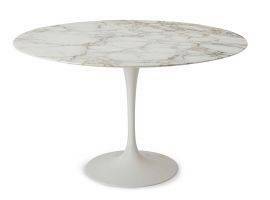 Soft lines or stricter, the dining table will be comfortable and the star of your dining room. Simplicity, tribute to a certain reductionism, which usually comes from minimalist trends. Sophistication, a more dynamic effect, more elements around, more colours, light and forms. All of this is possible, at the end it will be the one. 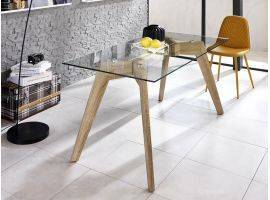 The dining table will give significance, the right harmony and balance to the environment. To underline immediately its visibility, the chairs could be essential. Even the lighting plays an important role nearby. If you are looking for a romantic atmosphere, could you imagine the smell of the burning wood in the fireplace mixed to the perfume of freshly cut flowers? Maybe you’d prefer a more intellectual and bare ambiance. Anyways, when you’ll get into the dining room, the table will be seen firstly, as if there weren’t anything else. Call us for each require, write your doubts and uncertainties, our best experts will be at your disposal to advice to find out the right choice for your home, your dining room and dining table. Don’t lose your time, choice the high quality and the experience of our professionals. Your satisfaction represents our victory.